I've heard of WC (water closet) but never heard of "bog". I heard it in maybe ‘86 from a British nurse in college. Not sure I’ve heard it since! P.S., I’m sure “trackies” are not to be confused with “trekkies”. I believe the most common everyday word for it is 'loo'. 'Bog' is regarded as a somewhat obscene expression for it. Imagine my surprise, that a 40-something nurse should be teaching us obscenity in college. Perhaps she had a different take on it..30+ years ago. Loo was the other one I knew about. Too much crap going on in RL today to have remembered it though. Brits call the bathroom the “bog”, maybe there’s a swing in there. Americans call it a bathroom because in homes it does indeed have a bath/shower 99.999% of the time. Calling it that anywhere else is just ingrained. Quote: By the ‘90s, the tracksuit itself was entrenched both as an on-field athletic staple, as well as a hip-hop icon. Did you intentionally ignore the previous few paragraphs, talking about the tracksuit through the 70s? 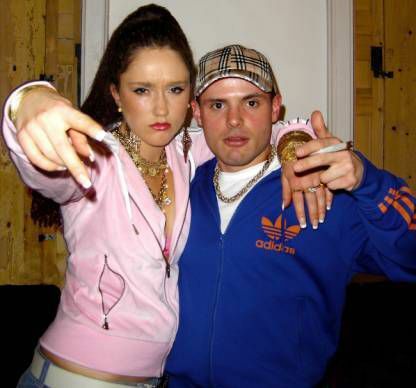 Or the one immediately following, talking about UK tracksuit culture? As, you know, that's the context that actually matters here. But yeah please tell me more about how American black inner city culture dictated the fashion of British white estate culture. Or you can put the spade down and admit that using the "everywhere is America" fallacy was a mistake. Ah, I should have specified America. My bad! I always ‘fess up when I’m wrong! Anyway, I got into track attire recently when I discovered you could get vintage suits from eBay. Velour and everything! So now, 17-20 later, I’m always comfy and stylish. I’m reminded of a MAD TV comedy routine with an old guy who’s always wearing a tracksuit. That’s me now! Most Brits have bath too, well do in house I live in and reference bog, you may found odd British person using the term however to me it the loo; lol! Just the bathroom and toilet are usually separated. Sometimes the bathroom also has an extra toilet, but the toilet is generally a separated "room". In U.S., real estate ads count “toilet only” as “1/2 bath”. Same here.... just varies to house like it does there - somethings on both sides of pond are same and somethings are not. Sure. When everyone else respects mine.